Do you have a company blog? Do you feel that somehow your blog is not taking off? Nobody seems to be commenting? Well, I think it’s a common problem in many companies. If you want your corporate blog to be successful, you can’t take it as another PR tool only. Sure, you can post news about your company, new product updates, events that your company is sponsoring etc. But corporate blogging much more than that, if you restrict your blog into all the above mentioned things alone then it’s not a blog… it’s just a “news section” of your website which happen to be in the blog layout and use WordPress. So, we have established that generally people do not visit your corporate blog only to read about your company news and Press Releases. What people really want is, to read blog posts that are insightful, interesting and relevant. Especially in the field that your business is in. These are the kind of blog posts that you have the expertise in, things that your company is good at. Things that other companies in the other fields do not have the privilege of knowing – be it via experience, domain knowledge, big data etc. For example, guys behind pingdom blog are a good example of how Corporate Blogs can be interesting. They regularly post interesting articles related to their business (they provide Uptime Monitoring and Server Performance Services). Not only interesting but revenue generating as well, because the more traffic your blog generates the more people will be aware of what your company does, and one day when the opportunity arises those people won’t be so hesitant to buy your products and services. Because they will be already indirectly familiar with your company. Who has better insight then Mailchimp guys about what kind of keywords work the best in Email Titles? They have sent over a 100 billion emails via their platform, so they have the data and analytics to write such insightful blog posts that are relevant to Online Marketing specialists. After you have started posting interesting articles, make it easy to share them on the net, particularly on Social Sites. Including just one “re-tweet” button can drive tons of traffic. 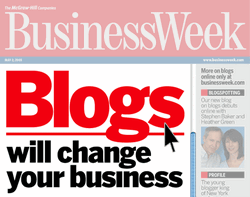 So make use of these online tools and make it easy for your blog readers to share your articles with others. your blog posts’ quality has improved, since the blogger is not behind the admin user, because now they are kind of responsible for what they post. Writing interesting and value-adding posts is one thing but being active and regularly producing good quality content is another. It’s not so much of producing daily posts but more of a regularity. Even if you post twice a week, as long as you stick to that timetable of yours, your readers will get used to it and will know what to expect from your blog. Being active also means communicating with your readers and replying to their comments. And more importantly building relationship with them. In order to maximize the affects of your corporate blog on the users, you need to be active on other Social Sites as well, particularly Twitter and Facebook. Create a Facebook Fan page for your company and make use of Twitter’s huge potential for your company. Don’t underestimate Twitter, some companies are making literally millions with it (Example: Dell makes over $3 million with Twitter). Most of the tips that I have mentioned above also applies to Twitter and Facebook equally; remember, don’t make it another boring press-release only tool! Example @BuySellAds uses its Twitter effectively, sharing useful stuff that are related to its publishers.